It’s a happy day for those who are looking forward to walking or riding their bikes on a safe, 10-ft wide, asphalt path from Blowing Rock to Boone. 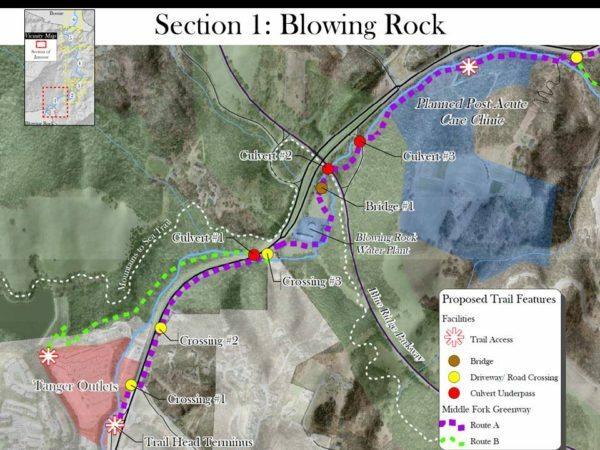 The Town of Blowing Rock has been awarded $2 million dollars from the Eastern Federal Lands Access Program (EFLAP) to construct a 1.3 mile segment (Section One) of the Middle Fork Greenway (MFG) across town and national park service property. With goals to promote increased physical activity levels and improve overall wellness for the community by providing infrastructure necessary for safer pedestrian and bicycle travel, The Appalachian District Health Department, through a community block grant, helped fund preliminary surveys and engineering through this section of the MFG. “There have been so many community supporters who have seen the vision over the years and contributed financially to get to this point” says Bill Hall, long-time MFG advocate. The Town of Blowing Rock is eligible for this grant because of connections the Greenway will provide across federal lands managed by the National Park Service (NPS) on the Blue Ridge Parkway. Blue Ridge Parkway’s Acting Superintendent, John Slaughter, expressed excitement about working with Middle Fork Greenway leaders to provide recreational access. To facilitate safe pedestrian and cycling infrastructure along the highway 321 corridor, NC Department of Transportation provided $145,000 last year to go toward a pedestrian bridge in this area. In addition to the Blue Ridge Parkway connection, the Middle Fork Greenway will intersect with the Mountains-to-Sea Trail, thereby allowing through-hikers safe access to walk to town. Non-profit leadership for the Middle Fork Greenway is provided by the Blue Ridge Conservancy, a local land trust working to protect agricultural, ecological, cultural, and recreational land in seven High Country counties, in partnership with High Country Pathways, a local organization that plans, develops, and steward trails and greenways throughout the NC High Country. The leadership team knows how important it is to protect the land and water resources through the development of greenway projects. “As this project develops we will stabilize streambanks, provide in stream habitat, and plant vegetation along the river to shade the stream and lower water temperatures for trout and other aquatic organisms”, says Wendy Patoprsty, Director of the Middle Fork Greenway. The EFLAP grant requires a 20 percent match of $514,000 which will be provided by the Middle Fork Greenway initiative’s numerous grants and private donations. According to Patoprsty, “Many partners and supporters are helping with the match requirements, including the NC Department of Transportation, NC Division of Water Resources, Blowing Rock Tourism Development Authority, Watauga County Tourism Development Authority, People for Bikes, and Blowing Rock Community Foundation. There are also many individuals who have given to the Greenway. Our team is so grateful for this support.” Patoprsty indicated that there is still a financial gap for Section One, and that additional private donors are needed to help fill the $200,000 difference. Patoprsty also expressed gratitude to ZAP Fitness in Blowing Rock for funding all operational and administrative costs of the greenway. Because of Zap’s generosity, every dollar raised for the Middle Fork Greenway goes directly to trail development. Currently, one mile of Middle Fork Greenway is completed from Tweetsie Railroad parking area that heads south (toward Blowing Rock) past High Gravity Adventures, Mystery Hill, under Hwy 321 to a 3.5 acre pocket park that was donated by the Whitener Family for the Greenway. For more information or directions, please visit our website www.MiddleForkGreenway.org or contact Wendy Patoprsty at Blue Ridge Conservancy.